I’ll be addressing this fad in more detail in an upcoming in-depth post, but the bottom line is this: so long as you don’t have celiac disease or known wheat allergy or gluten sensitivity, you don’t have to worry about eliminating gluten from your diet. Gluten doesn’t make you fat or unhealthy, and it doesn’t wreck your brain. In fact, swearing off gluten entirely can make it more difficult to get nutrients like fiber, folic acid, and iron. That said, gluten-free dieting is an effective way to reduce carbohydrate intake (and thus calories) without sacrificing taste. I hope you enjoy the recipes! Most bread is made from wheat flour, but did you know the main ingredients in bread can actually be protein powder, eggs, and a vegetable? 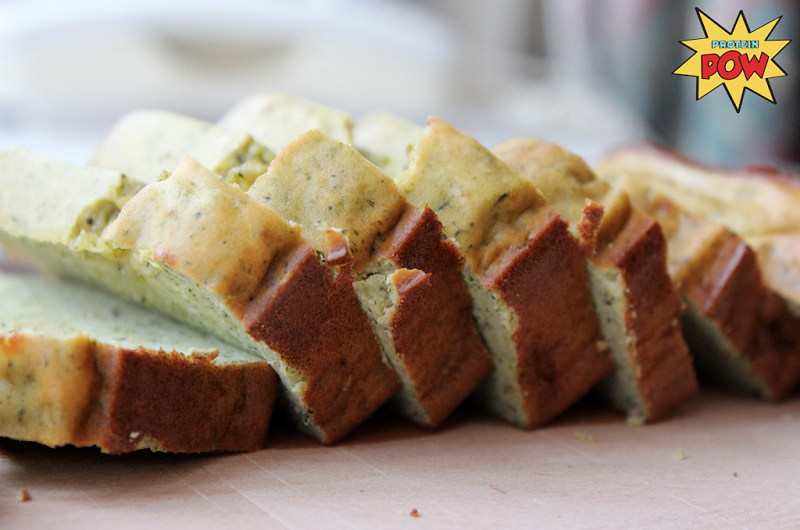 Steamed broccoli is the secret to this protein-packed bread, which is able to be sliced up and turned into sandwiches. 1. Preheat the oven to 320°F (160°C), and steam the broccoli. 2. In a medium bowl, mix together the two protein powders and salt, and add all eggs. Stir to combine. With a blender, process with the steamed broccoli. The finished dough will be thin. 3. Transfer to a standard loaf pan, and bake for about 40 minutes. Picture courtesy of That Was Vegan? This one will trick you in two ways: taste and texture. If your only concern is gluten-free, there are pastas made of rice flour, but if you also want to reduce the calories of the meal, you can chop up some fresh cauliflower instead. When cooked, it becomes soft yet firm just like cooked pasta. 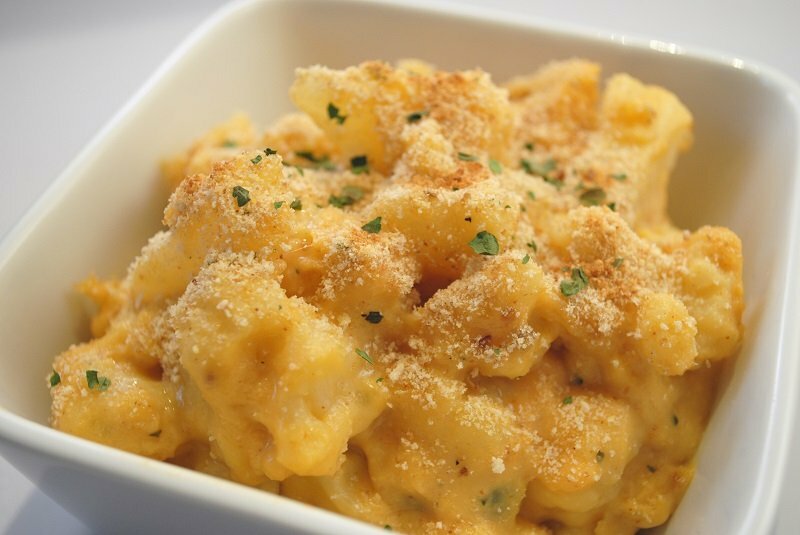 The “cheese” in this is actually made from almond milk, yeast, and seasonings, but you can also use this method to replace pasta with cauliflower in your family’s favorite recipe. 1. Chop up the cauliflower into small pieces. Cook them in a pan over medium heat until semi-translucent. Transfer to a large bowl. 2. Mix together almond milk, yeast, coconut oil, mustard, garlic powder, salt and pepper until well combined. Pour over the cauliflower, and mix well. 3. Preheat the oven to 350°F. Pour the mixture into a large baking dish or Dutch oven, and sprinkle ground flax over the top. Bake for about 15 minutes, and for a crisp golden crust, finish for a couple minutes on broil. 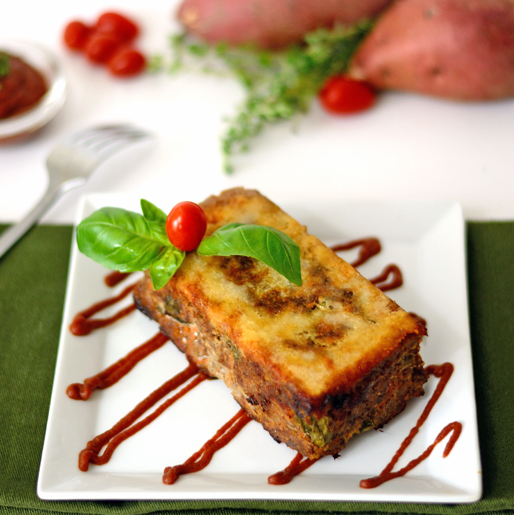 By name alone, meatloaf sounds like pure protein. But aside from the ground beef and pork, the loaf part of the equation traditionally comes from breadcrumbs, making this classic dinner a gluten-free challenge. You can choose to use rolled oats, but this recipe goes the more modern route with almond flour and shredded sweet potato. 1. Preheat the oven to 400°F. Coat the bottom of a loaf pan with 1/4 cup of almond flour. 2. In a pan over medium heat, cook the diced onion in olive oil for two or three minutes, until translucent. 3. Mix together all ingredients in a large bowl. Transfer to the loaf pan, pressing the mixture into the bottom layer of almond flour. 4. To prevent cracking, wet your fingers under running water, and gently rub them over the top of the meatloaf. 5. Bake for 40 to 45 minutes, until the internal temperature is 160°F. 6. Leave to cool for 10 minutes, and then turn out onto a serving platter. Most of the time, chicken breast gets flavor from a simple marinade of olive oil and seasonings. But even with the best free-range chicken, that can get old after a while. Mix it up with a topping of this popular eggplant dip, which will keep the meat juicy while adding some Mediterranean flavor. 2. 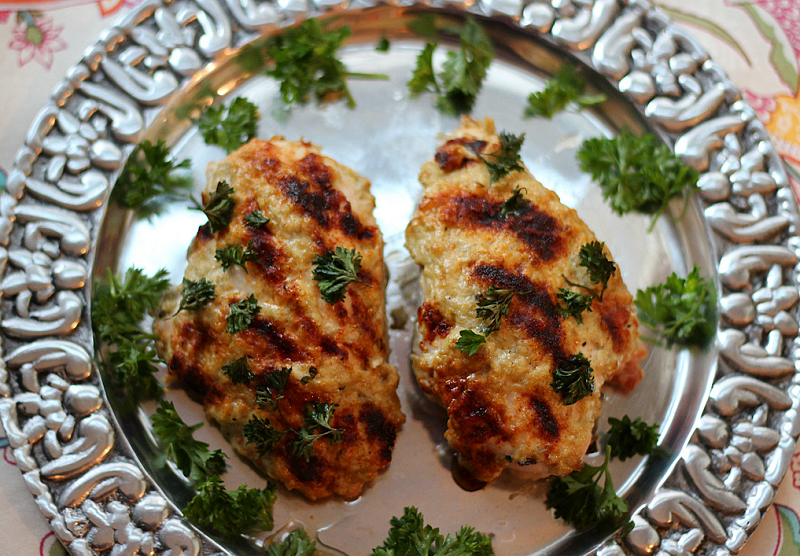 In a large baking dish, lay the chicken breasts, and spoon babaganoush on top. Sprinkle with paprika and most of the parsley. 3. Bake for about a half hour, until chicken is cooked through. Garnish with remaining parsley. Gluten-free main dishes aren’t hard to come across. All you need is a simple meat dish, like the one above. But what can be tricky is coming up with a delicious side to serving along with the entrée. Here’s one so flavorful it’ll make even the plainest steak or chicken breast feel complete. Plus, it’s the perfect match for Baked Chicken Babaganoush. 1. To toast the pistachios, heat a covered skillet over medium. Add nuts, and remove when fragrant, about 4 minutes. Let cool in the bowl of a food processor. 2. Heat olive oil in the pan, and add the diced shallot. Cook for a couple minutes, and then add garlic and quinoa. When the quinoa is starting to turn brown, about 3 minutes, add the water and salt. Leave to simmer on medium-low heat for about 15 minutes. 3. Once the quinoa has absorbed all the liquid, remove from heat and cover. Let sit for 5 minutes so the quinoa can continue softening. 4. Roughly chop up the pistachios by pulsing the food processor. Add the mint, and continue pulsing until the leaves are integrated. 5. 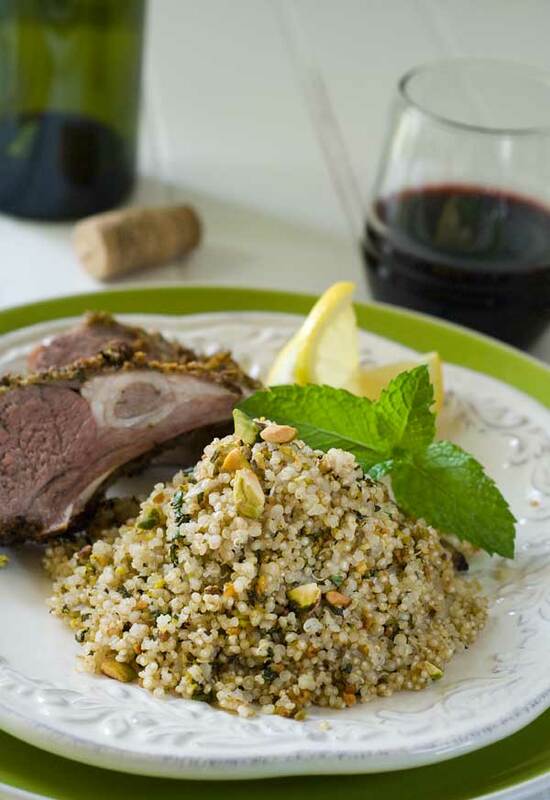 Add the mint-pistachio mix into the quinoa, and fluff with a fork. Serve. 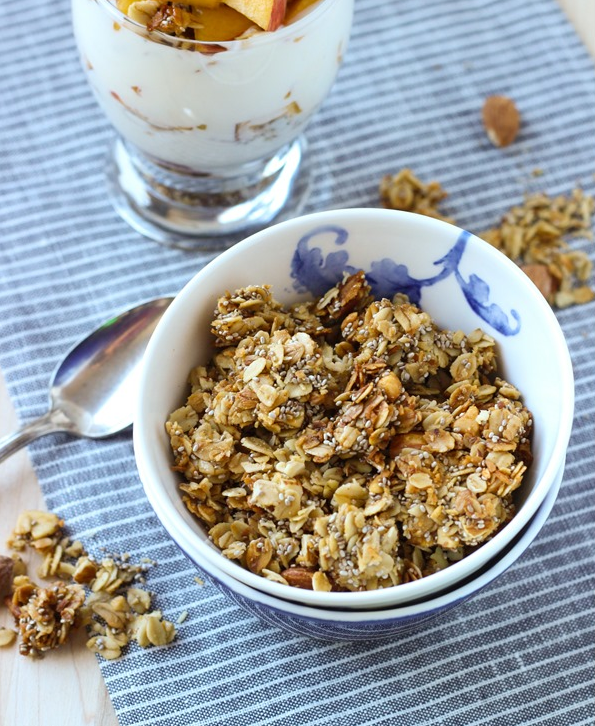 A versatile pantry staple, granola triples as a nutritious breakfast, pre-workout snack, and guilt-free dessert when layered with creamy Greek yogurt. But the good stuff can be pricy in grocery stores, especially if you need to find guaranteed gluten-free. Make your own, and you’re not only able to control the ingredient but cut costs. This recipe has all the best basic flavors to build on – coconut, almond, and vanilla – with minimal add carbs in the way of sugar. Serves 12 / Makes about 24 oz. 1. Line a large baking sheet with parchment paper, and preheat the oven to 300°F. 2. Mix together the rolled oats, almonds, chia seeds, salt, and shredded coconut in a large bowl. 3. In a separate bowl, blend the honey, coconut oil, coconut sugar, vanilla extract, and egg whites. 4. Pour the wet ingredients into the dry, and stir well. Spread out onto the baking sheet. 5. Bake for a half hour, stir, and return to the oven for another 15 minutes. 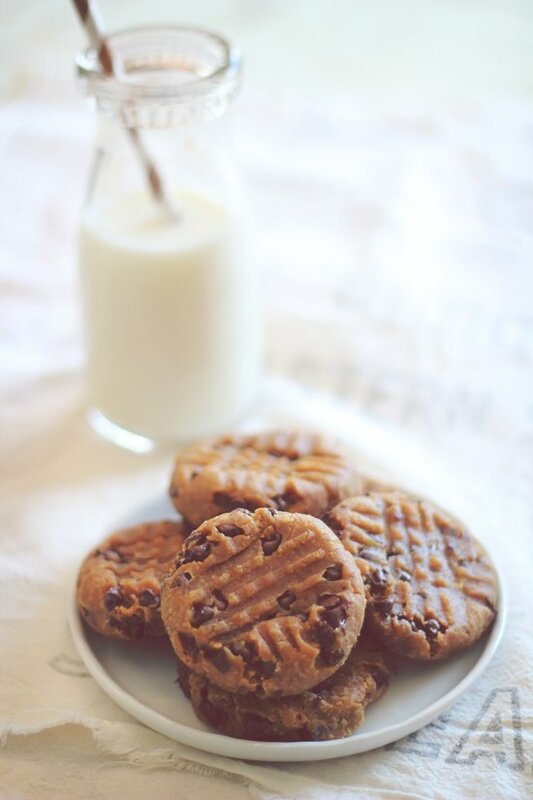 The beauty of a gluten-free cookie isn’t what it doesn’t have, but what it does. These are as nutritionally balanced as it gets with near-equal amounts of protein, fat, and carbs. Plus, these use stevia so you can also skip out on the sugar while satisfying your sweet tooth. 1. Preheat the oven to 350°F. Line a baking sheet with parchment paper, or lightly grease with coconut oil. 2. In a medium-sized bowl, beat the egg and egg white, and mix in peanut butter and applesauce. 3. In a separate bowl, combine the vanilla protein powder, rolled oats, stevia, baking soda, and salt. 4. Add the dry ingredients into the wet, and stir until almost integrated. Pour the chocolate chips over top, and fold in. 5. Wet hands so the dough doesn’t stick, and form it into two dozen balls. Arrange evenly spaced on the baking sheet, and press down with a fork to make a cross. 6. Bake for 8 to 10 minutes, until starting to brown. Let cool for 10 minutes, and enjoy. 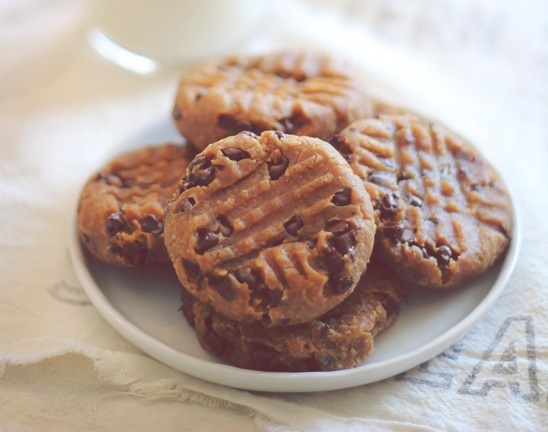 What do you think of these gluten-free recipes? Have anything else to share? Let me know in the comments below!